Her purple overlay (clear, plastic sheet) helped when put over text. She reported “When reading I can focus better and remember more. It helped with headaches and calmed my brain”. She still experienced some difficulty though, as she was sensitive to bright lights and also had problems when writing or doing math as she could not use her overlay when writing on the page. At the end of the Diagnostic session I checked to make sure the green color worn as glasses helped with all of the points she mentioned in her original list, including reading her play script as she had brought it along. In her own words “I like it, my brain’s calmer, it’s clearer and easier to look at”. She was able to scan for words and could track lines without using her finger. 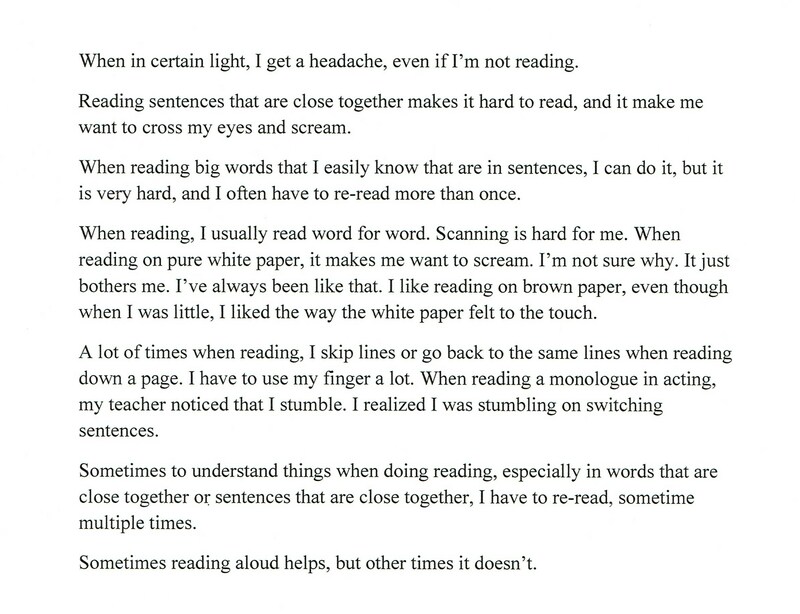 Her mom agreed to share her daughter’s description of her visual processing difficulties to spread awareness…. does this sound like you or someone you know?